Saunders had the type of game that an Ivy League Player of the Year has when it’s for all the marbles. Watching him in the second half, where he scored 18 of his 22 points, it was impossible not to realize that it was he, and not Yale junior forward Justin Sears, who was the best player in the conference. Though done in dramatic fashion this year, this is old hat for Saunders, Moundou-Missi, and the rest of the senior class that has won four straight Ivy League NCAA tournament bids. All of that aside, the best play of the night wasn’t made by Saunders, or by Moundou-Missi. It didn’t even occur during the contest. 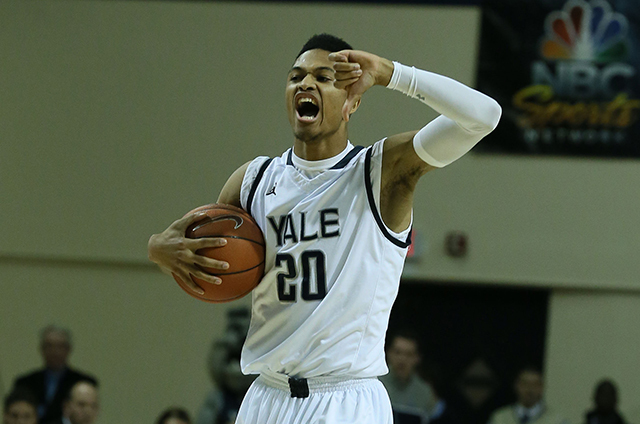 Yale senior guard Javier Duren had all the pressure on him after Moundou-Missi nailed that jumper. Despite coach James Jones claiming postgame that it’s his philosophy to not call a timeout in that situation, Duren subsequently told reporters he wasn’t aware of that. So as he crossed midcourt as the seconds ticked down, he hesitated before ultimately driving into the lane. The look he had wasn’t a bad one. But it didn’t drop. Yale had an opportunity to tip the ball in just moments before time expired. That didn’t drop either. While Sears could be found, understandably, sitting with his hands in his head post-game, frustrated at what could have been, his counterpart, Duren, arrived at the podium with a smile on his face. There are a good number of players like Saunders in the NCAA. Those players will all be on display over the next few weekends, where their plays on the court will wow fans. And there is certainly a reason to be infatuated with those players, who rise to the moment when it matters the most. But there aren’t enough people like Duren in sports currently. He has an understanding of the history and the stakes, but he also understands that at the end of the day, the journey will be so much more valuable to him than the result. It was so good to see a player defy a sports culture in which victory is not just everything but the only thing. Players like Saunders are wonderful to watch for their skill on the court. And he will be the one people who saw highlights later that night or even watched the game in person will remember. But people need to learn from the manner in which Duren carried himself after losing, if only to remember that there can be strength in failure. Realizing that just depends on your perspective. a great commentary. I wish I’d been at that press conference. Thanks for your reporting! I never had a hero in my life, someone to look up to. Javier Duren has changed that. I can not thank both him and the writer enough.